Interlocutor: But is it not part of the essence of EON that Nero burns Rome, Kennedy is assassinated and that Jesus is crucified? Eon: Those examples you are giving here, in billions of millions of planets similar episodes happen, with martyrs, with heroes, people hated, where other channelers have made me the same or other questions, and the answer is that there are things that I cannot do. I cannot create a companion, because I cannot create an essence similar to mine. That does not mean that I am limited. There are rules that somehow I have created when manifesting myself. I manifest in a certain way, and within the vibration of that manifestation, perhaps I have set myself those limits. The other question is: Did I create myself or I have always been? Eon: Sure, because at some point I also encounter with the previous EON… The previous EON is a way of saying regarding your measurement of time... Let's say that if the last universe connects with the first universe, that higher octave fits with that lower octave, and I also fit myself, EON from the future, with me, EON from the past. Eon: That is what I mean; yes there may be movement, because if there is no movement and EON was fixed, I could not even fit the EON from the past with the EON from the future. Interlocutor: Okay, but there is a point I want to clarify: Jesus, who at this moment is suffering on the Cross, was not created by you but he is part of your essence from the eternity. Eon; He is part of what I have created, which is the free will and free will allows the creatures to choose, to have an option. Do not fall into the phrase that has often been said that everything is written, because at some point the players are the ones writing that part of history in different worlds, in different planets, in different galaxies. Although for me everything is an Eternal Present – because I can live it at this moment and as well, I can look at it from the future, and as well, I can look at it from the past, as it has not happened but I have to let it happen – by the principle of non-intervention, I give all my children the possibility of choosing. Interlocutor: What I don’t understand is how can we say that EON created, for example, a cockroach, if in Eon’s eternity, the cockroach always existed… Will it be as Hermes said that everything it’s and it’s not, at the same time? Eon: Exactly, everything it’s and it’s not at the same time, and in each created universe, in each of the Big Bang explosion, I give new tasks to the minor gods, the Elohim, to create the various spirits and the various angelical entities, which in fact I do create them, because I am the one that gives the energy to the Elohim to create the living beings. Any power of the Elohim is my energy. Then, when you write: "The Absolute creates the Elohim, and the Elohim creates the spirits and the angelical entities", etc., etc., in fact, they create them through me. Eon: I cannot be outside, because you have just said so, you are part of me, but I cannot get involved in everything as you put it either, because suddenly it might be a supernova star that sweeps many planets, which sweeps two civilizations and billions of beings die. I see those things as a fact, but I don’t get involved. Interlocutor: Is it because for a matter of duality? Eon: No, it is as a matter of education. Do not see it as a duality of suffering-pleasure, because one could understand that I'm enjoying this duality. It is not joy or suffering. The universe is a school of learning, and so the creatures are learning. Interlocutor: But the matter is that if I were EON I would have created only pleasure and sheer happiness… So the question of the million dollars, it is why EON has not done what I would have… Specifically, why is suffering necessary? Interlocutor: Are you telling me that EON is unable to create happiness that does not produce engrams? Eon: The answer is simple. Of course I can create happiness that does not cause engrams!, But the spirit itself, the vibration that I have created… it was done on purpose with that type of “anxious vibration”, making that happiness could produce engrams. Interlocutor: Let's see if I understand: are you, the eternal EON, with limitations? Interlocutor: I would leave all this on hold to give us time to study and mature it and ask you something that I consider important... I, spirit – not me as 10% but Radael, as 100% spirit – when the Big Crunch arrives and finally I plunge with everyone else in EON, where do we do it, within its core, outside the core, or where? The question is whether we will absolutely understand the Absolute, along with all the infinite Big Bangs. Before you respond there is this other question: Does Radael continue with its individuality or it’s like a drop in the sea that returns to it? Eon: First, when the Big Crunch takes place, the universe is no longer as such and everything gets transformed. According to physicists it’s transformed into a Singularity. The universe ceases to exist until is Nothing. Eon: Exactly, the universe… EON adapts, and within the physical plane, which then would be compressed into an atom, EON would be as small as an atom in the physical and spiritual planes, because the spiritual plane would also accompany the physical plane in the Singularity. This has never been said. But I am also beyond the planes and then along with that Big Crunch, what you call my core, that immovable part, merges with the movable part. And all my children melt with me, and somehow, as it has been said a few years ago, yes… they lose their identity. Interlocutor: Is it like a drop that falls into the sea? Eon: That's right. It’s like a drop that falls into the sea. Eon: Yes, at an exact moment. When there is a new explosion and a new universe is formed, I return again to create the entire structure: Aes, Essence, Elohim, to whom I give the task of creating new spirits, which are not going to remember the previous universe. That is why I said that I had to do what you would call a "trick" to take Johnakan to a previous universe, because in that previous universe Johnakan did not exist. Eon: Exactly, but I say that so I can be understood. I am outside all times and all spaces. Interlocutor: So, when Radael merges with the Absolute, he disappears and is the Absolute? Eon: That's right, Radael is part of the Absolute and is the Absolute, in the same way as the drop is the sea. Interlocutor: Let's see if I can concretize the idea: This part of mine, which at this time, with my limitations as a spirit, I cannot understand EON, I will understand perfectly when I melt with Him because I am also going to be Him… Is it so? Will I be everything as EON? Interlocutor: But, is the part that incarnates always the same 10%? Eon: Not necessarily. Just like you when incarnate as roles, it does not always incarnate the same 10%; the 10% of this vessel, Jorge Olguin, perhaps is not the same 10% who incarnated as Juan de la Cruz or as John Zebedee or as Ananda. But the essence of the spirit is all the same. Interlocutor: But the core never incarnates… Is that correct? Or everything is core or nucleus. Eon: Actually there is no core or nucleus… “Core” is just a way of saying. See me as a spirit of another magnitude, and the spirit does not have a nucleus. You, as spirit, do not have a nucleus. You are a 100% pure spirit that incarnates, in which case your 90% is in the spiritual plane and 10% on the physical plane. You are a conceptual thinking energy. Eon: Well, you can define me as an absolute conceptual thinking energy. 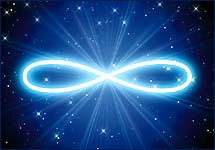 Eon: Perhaps the word "absolute" might give you a clearer idea because it is deeper than "eternity" or "infinite", because infinite could be multiplied by itself, and you could also add eternity plus eternity. The word absolute covers everything and that's why to talk about of absolute plus absolute does not make sense, even for the greatest mathematicians. If you wish, call me an absolute conceptual thinking energy. Interlocutor: Then, is there any core? Eon: Would you like to find a core? Interlocutor: I understand… Before concluding the meeting, may I ask you some short questions? Interlocutor: What is the happiness of EON? Eon: The diversity of my children. Interlocutor: Is that the answer? Eon: That's right, and to see how little by little my children understand that. Then many will ask me: How sad, EON, that in the end, when we will get to understand everything, when we will have our fellow beings – because every being of this Creation will attain enlightenment – immediately after, we will merge with the Absolute to start again a new thing… Is it not a pity a fresh start? It is a pity for you that you look at it from your attachments. Let's see if you understand me. You look from the attachment, from the attachment to say: Now that we learned the lesson you close the school. Is it understood? Eon: If I were to refer to an attachment, it would be my attachment to happiness and love. Interlocutor: Specifically, then, EON moves, creates and can do almost everything. Is that correct? Eon: Somehow it does, and somehow no, because if I at a certain time, look for to manifest myself in the physical universe, it means that even at a moment, and think about it of what I am saying to you, I was before the universe because I manifested myself, and to manifest myself was an action, and that action took time. Please, try to understand it. Interlocutor: It’s clear… Were there moments where EON was no creation? Or EON is part of the creation and cannot be separated? Eon: There was a moment that was before the creation. For that reason I manifested myself. The simple fact to manifest myself then, even for a thousandth of a second, or less, was an action, and that action took time. Therefore, there was something before. Because, let's see, and this is work for physicists, if I said before that the universe is like a Moebius Strip, and the last universe, that one in the distant future, and that one of the distant past, are embedded, theoretically the universe always existed . Eon: So, how could I have manifested myself before, if the universe was always there? Always, in this dimension, but remember that I said in the first part that there are other super-universes, and it would be very difficult to understand for those who listen to me, because the universes are like bubbles and there are also other super-universes involved in my creation. At this moment, this vessel has on Earth a transmit fidelity in his decoder nearly 99%, but it is very hard for him to translate what I mean. So, before his decoder explodes, we better let this issue pending for the next session. Interlocutor: OK… There are some questions that people ask me repeatedly, and also interest me, as for example, when will the Earth be contacted openly, in public, with extraterrestrials. I ask this because so far the extraterrestrials are hidden, as in the famous Area 51 in USA, where there is an extraterrestrial-terrestrial settlement land, so… I see a lot of misinformation in order to hide the truth. Eon: I will answer in three words and do not ask me for more: the possibilities are. Interlocutor: Is that all? How long will it take… centuries, perhaps millennia? Eon: I want you to make that expectation, because the expectation brings intention. A healthy expectation brings intention, and I want that the beings on this planet work with that intention. Interlocutor: Well… How tall are the smallest and the highest extraterrestrial? Interlocutor: Nothing more than a tenth of a millimeter? Interlocutor: And, do they build spacecraft as well? Eon: Yes, but obviously in their scale. And there are beings that measure up to 100 meters of your measures. Interlocutor: And, have they reached our planet? Eon: No, not at all. Interlocutor: Up to what extent can we create artificial intelligence? The question seeks to know if somehow the 10% could incarnate in a machine that has been built in some planet, obviously very sophisticated. I refer to a machine that is almost as a body that was born from a being. Eon: Whenever there is a decoder that can grasp the mental concept of the spirit, and that concept fits in that mental decoder as to enable the spirit to translate the spoken language, then is valid. Therefore, the same spirit that incarnates today in a homo sapiens-sapiens can also incarnate in a being from another world that may have a completely different form and be a thinking being like you. Interlocutor: The question is whether it has been built a machine like that. Eon: There is at this time, in different worlds of different galaxies, artificial "beings" that have a sufficiently advanced decoder that is able to incarnate. I clarify that the word "incarnate" is yours, not mine, because there are beings that are not organic as you, but I use it to be understood. Interlocutor: Are we talking about artificial beings made on the physical plane by other incarnated beings? Eon: That's right. They are like robots or androids, as described by writers of science fiction. Interlocutor: Do you mean that a spirit can incarnate in those tins? Eon: To call tins to those robots is very derogatory! Interlocutor: Well, you know that I said it with great humor, just to be incisive in this. Specifically, then, it is possible. Eon: The issue is quite complex, but it's possible. That biologist or physician who denies this, does not reality understand the scope of what some advanced civilizations can do. The argument that biologists could give would be that neurons are connected in parallel rather than in series as in some machines. Then, to make an artificial brain with connections in parallel, where there are millions of connections, would seem something impossible. But it would be pedantic to say that because this is still denied to this terrestrial civilization, it must also be denied to other civilizations, as it was pedantic of your Earth, some few centuries ago, to deny that there were other worlds. Interlocutor: In those advanced civilizations, have they reached to the point of being able to remove engrams through a machine and not for auditing? Eon: They have succeeded in eliminating the cellular engrams, but not the conceptual engrams, because no machine reaches "to touch" the spiritual part. Interlocutor: When we talk about these androids or robots, are we talking about rudimentary machines or they can perfectly compete with the creations of the Elohim? Eon: Perhaps not at this present, but the possibility is part of me. Do not disrespect what we believe is invalid, and never admire excessively what we believe is the supreme, the maximum. Let's always keep the balance, only admire love and despise hatred and indifference. Any form of life could somehow be important and everything has a reason. Until always beloved son. Interlocutor: So long EON, until the next session. This entry was posted at Saturday, July 25, 2009 and is filed under Dialogues with EON . You can follow any responses to this entry through the .